This first guide covers Lighting, including broadcast studio lighting and portable lighting. 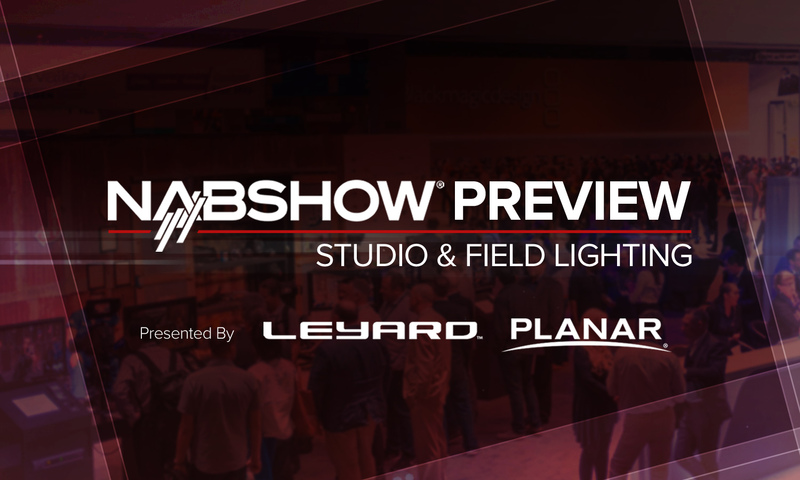 From the latest studio grade light panels to new Fresnels ready for ENG usage, our guide covers some of the top vendors on the show floor and what you can expect to see. Along with its full line of lighting products including the popular SkyPanel, Arri will let visitors experience first-hand its new Alexa LF camera and Arri Signature Prime lenses. A newcomer to the world of LED lighting, Astora unveiled a new line of LED light panels ahead of the NAB Show. Barbizon will showcase its full line up of studio lighting technology during the NAB Show. Sharing a booth with Devlin Design Group, Brightline will highlight recent project usages and its full line of lighting instruments. Celebrating five years, Cineo Lighting will feature the latest in LED lighting technology for broadcast, television and motion picture, including the Standard 410 light panel and the new NBCUniversal LightBlade Series. Fillex introduced a new LED Fresnel ahead of the show, the Q8 Travel. The instrument is aimed at addressing three major needs of every production including the ability to mix well with other fixtures, solid construction and intuitive control. Fluotec will showcase its CineLight soft LED lighting system including panels in a 4, 2 and 1 foot version along with its popular StarMaker led panel and StudioLED Fresnel. Just announced, Chimera Lighting will feature a frameless lightbank and a lantern for the Fluotec CineLight 60 at the NAB Show. Ahead of the NAB Show, Ikan has announced a variety of new products including a new line of camera cages, portable teleprompters, ring lights and two new LED lighting instruments. The new lights include the Helia LED Fresnel and CB8 canvas fabric LED light. Kinotehnik will highlight the just announced Practilite 802 bi-color, power-panel LED lighting instrument during NAB. Litepanels, a Vitec Group brand, will showcase the all-new Gemini 2×1 soft panel. The Gemini’s latest firmware upgrade allows for a variety of cinematic effects such as emergency lights, fire, TV, and hue bursts that are fully customizeable and that can be easily saved to presets. Nila will highlight its new portable ENG light the Nila Varsa, featuring a weatherproof chassis, new ergonomic design, and new control software. The company will also show updates to its Zaila line of fixtures. Outsight’s NAB booth will include its latest offering such as the Creamsource Micro, Sky, Doppio and Mini. Rotolight will bring its Anova Pro 2 to the NAB Show for the first time. The Rotolight Anova Pro 2 is designed for the most demanding of professionals, offering 70% more power output than its predecessor with one of the brightest LED lights ever launched in its class, delivering 10,700 lux at 3 feet. Rosco Labs will highlight its full line of LED lighting products including the Silk soft panel, RoscoLED tape, X-Effects LED Projecter and DMG Lumiere. Zylight, now part of Ushio America, is a manufacturer of LED lighting instruments for film and video production.